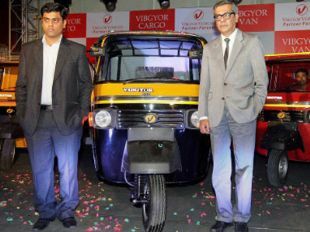 Vibgyor Vehicles Ltd, the automobile wing of Vibgyor Group has forayed into commercial vehicle segment. The organisation will be launching a range of 3 wheelers - Vibgyor Auto (passenger vehicle), Vibgyor Cargo (pick up van) and Vibgyor Van (delivery van) from April, 2013 in West Bengal, Bihar, Jharkhand, Orissa, Assam and Uttar Pradesh. The vehicles will be manufactured in an exclusive technical collaboration with Pashupati Vehicles, Sonepat who are one of the leaders in the segment. Greaves Cotton Ltd will be a channel partner to this initiative supplying state of the art engines to the production unit. These 3 wheelers will be priced between Rs 1.75 lakh to Rs 1.85 lakh. Vibgyor Cargo, which comes in three stunning colours - Yellow, Blue & Red colours. The engine capacity for the range will be 435 cc. These diesel - run vehicles are estimated to give a mileage of 36 kms per litre. With a capacity to manufacture 1000 vehicles initially at the Dankuni unit the company plans to double the capacity by 2014. Spread over 10 acres of land, the assembling unit in West Bengal will be having separate Transmission lines, Paint Shop and Body shop with CNC machines procured from global manufacturers. The company targets to sell 3000 vehicles by March, 2014 thereby eyeing a turnover of 400 million INR and creating employment for 500 people, directly and indirectly. "Vibgyor Vehicles will be the first company in West Bengal to manufacture 3 wheelers. These 3 wheelers will be competitively priced and we would provide easy finance options to our valued customers. We will be exporting to Bangladesh initially and would then target the East African market. By 2015, these vehicles will be available across the country", said Mr DibakarChakraborty, CEO, Vibgyor Vehicles. These 3 wheelers have not only contributed significantly towards solving day to day commuting problems of a large segment of population especially in rural areas across the country but also prove to be a cheap and convenient mode of goods transportation .This industry has a very strong potential of employment generation in so many direct and indirect ways. The company plans to have about 75 Dealerships in a year's time in Eastern India and will be focusing extensively in the rural market. Apart from Sales, the Dealerships will provide after sales service and an effective spare part storing system. Vibgyor Vehicles will provide training to the dealers and service engineers for servicing of these vehicles. The dealerships will create employment generation in the rural belt across States.